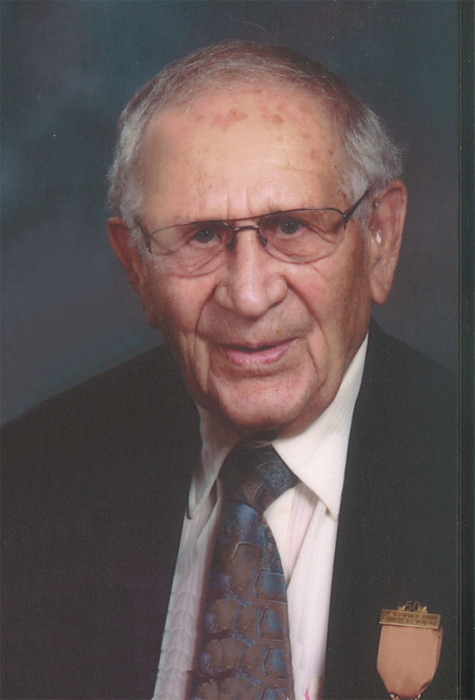 ELWOOD PIERCE SHERMAN, beloved husband of Beth, passed away peacefully at the Chinook Regional Hospital in Lethbridge, Alberta on October 11, 2018, at the age of 96 years. Elwood was born on December 3, 1921, at Duchess, Alberta. On December 9, 1944, he married the love of his life, Jessie "Beth", and they farmed in the Duchess area until 1973. They moved to Lethbridge where he worked at Canbra Foods as a field representative. They enjoyed spending their summers at Duck Lake, Montana for many years, and their winters in their motorhome in Arizona. They also enjoyed many years of camping at Gold Springs Park. Elwood is survived by his loving wife Beth; his sister Faye Keevil and his brother Laverne Scheuerman: his children; Beverley (Ed) Seitz, Howard Sherman, Charles Sherman, Eileen Reid, Cheryl (Marv) Nelson, Darcy Sherman; nine grandchildren, eleven great-grandchildren, as well as numerous nieces and nephews. Elwood was predeceased by his daughter-in-law Ellen Sherman, son-in-law Roger Reid and shortly after his passing, his daughter-in-law Terry Sherman. Elwood’s family would like to express their thanks to the caregivers at Edith Cavell Care Centre and Home Care Lethbridge. A Memorial Service will be held on Thursday, October 25, 2018 at Christensen Salmon Generations Funeral Home, 703 – 13 Street North, Lethbridge, AB at 1:00 p.m. with Rev. Glenda Wert officiating.